Termination circuits (resistors) are connected across the can communication system. When transmitting a can communication signal, each control unit passes a current to the can-h line and the current returns to the can-l line. 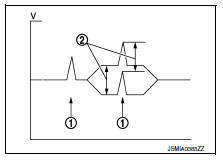 The current flows separately into the termination circuits connected across the can communication system and the termination circuits drop voltage to generate a potential difference between the can-h line and the can-l line. A signal with no current passage is called вЂњrecessiveвЂќ and one with current passage is called вЂњdominantвЂќ. The system produces digital signals for signal communications, by using the potential difference. 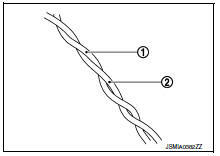 The can communication line is a twisted pair wire consisting of strands of can-h (1) and can-l (2) and has noise immunity. The can communication system has the characteristics of noise-resistant because this system produces digital signals by using the potential difference between the can-h line and the can-l line and has the twisted pair wire structure. Since the can-h line and the can-l line are always adjacent to each other, the same degree of noise occurs, respectively, when a noise (1) occurs. Although the noise changes the voltage, the potential difference (2) between the can-h line and the can-l line is insensitive to noise. 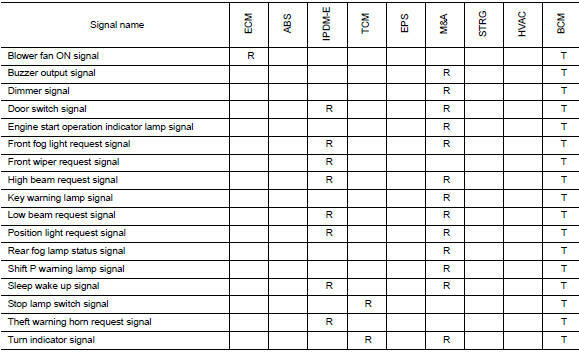 Therefore, noise-resistant signals can be obtained. Each control unit of the can communication system transmits signals through the can communication control circuit included in the control unit and receives only necessary signals from each control unit to perform various kinds of control. 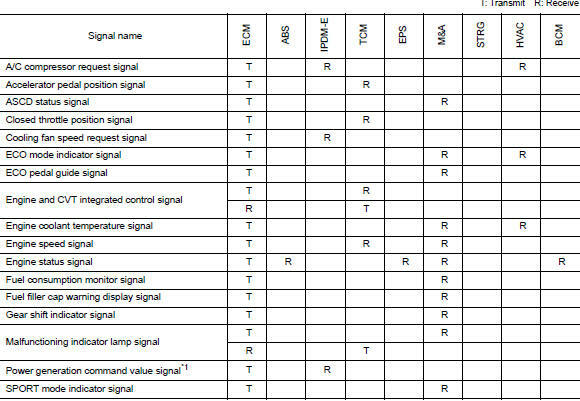 The above signal names and signal communications are provided for reference purposes. For can communications signals of this vehicle, refer to lan-30, "can communication system : can communication signal chart". Can communication control circuit is incorporated into the control unit and transmits/receives can communication signals. Can controller It controls can communication signal transmission and reception, error detection, etc. Transceiver ic It converts digital signal into CAN communication signal, and CAN communication signal into digital signal. Noise filter It eliminates noise of can communication signal. 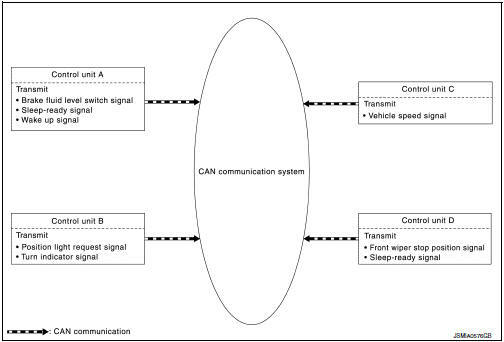 Generates a potential difference between CAN-H and CAN-L.
*: These are the only control units wired with both ends of CAN communication system. 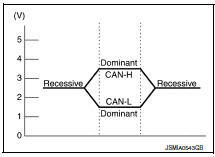 Determine CAN system type from the following specification chart. Refer to lan-16, "trouble diagnosis procedure" for how to use can system specification chart. 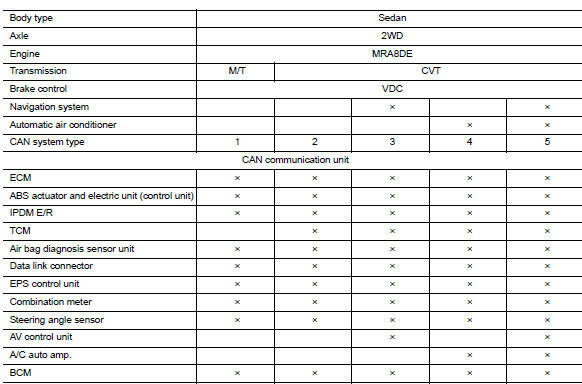 Check CAN system type from the vehicle shape and equipment. 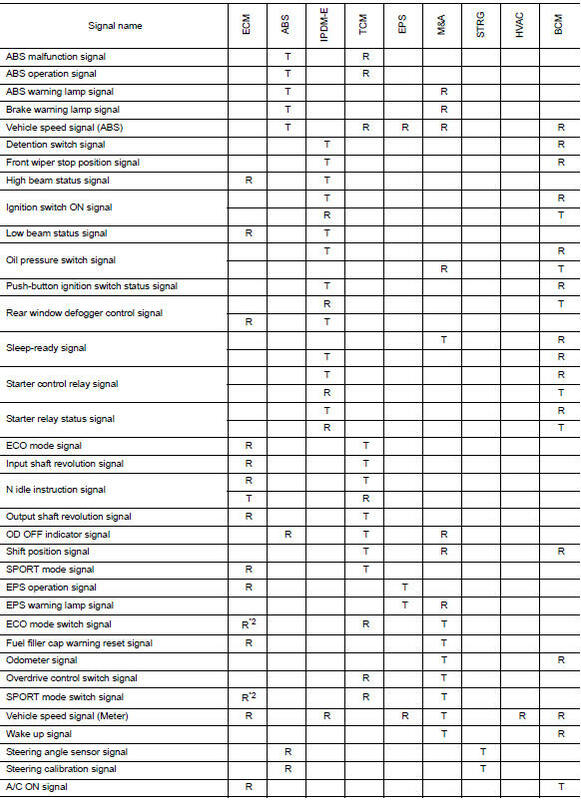 Refer to lan-15, "how to use can communication signal chart" for how to use can communication signal chart. Refer to lan-21, "abbreviation list" for the abbreviations of the connecting units. Can data of the air bag diagnosis sensor unit is not used by usual service work, thus it is omitted. 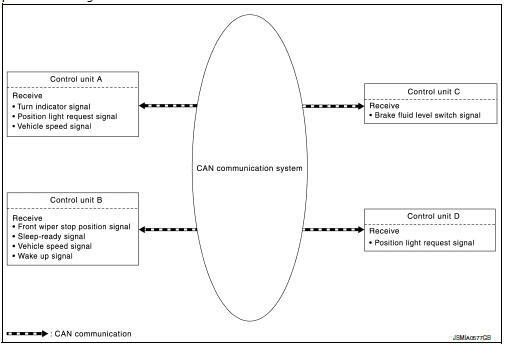 The av control unit uses can communication only for communicating with the diagnostic tool (not with other connected control units).